Of all the Chromebooks ever made, I’d say the original ASUS Chromebook Flip is the one with the most anticipated follow-up. The Chrome OS world was buzzing at the end of last year when rumors began swirling around an updated Chromebook Flip. With a Core m3, 12.5-inch screen, boxy build and totally redesigned look, what eventually became known as the ASUS Chromebook Flip C302 was not really the successor to the original. In fact, it felt like a completely different device all-together. And it really was. Don’t get me wrong, the ASUS Flip C302 is easily one of the best Chromebooks you can buy (THE best according to some) and will remain in that position for quite some time. It just wasn’t the true successor to the original Flip many people were hoping for: a small, portable, consumption-focused Chromebook. Would The Real Flip 2 Please Stand Up? We began covering a Chromebook codenamed ‘Bob’ almost a year ago. With it showing up that long ago in the repositories, we thought a summer 2017 release would make a lot of sense. However, summer came and went with the only 2 new Flip devices from ASUS being the C302 and C213. Even through all the waiting, I remained confident we’d see a proper follow-up and we confirmed that device not too long ago. The device has made appearances at trade shows and random online retailers, but the rollout hasn’t felt complete. 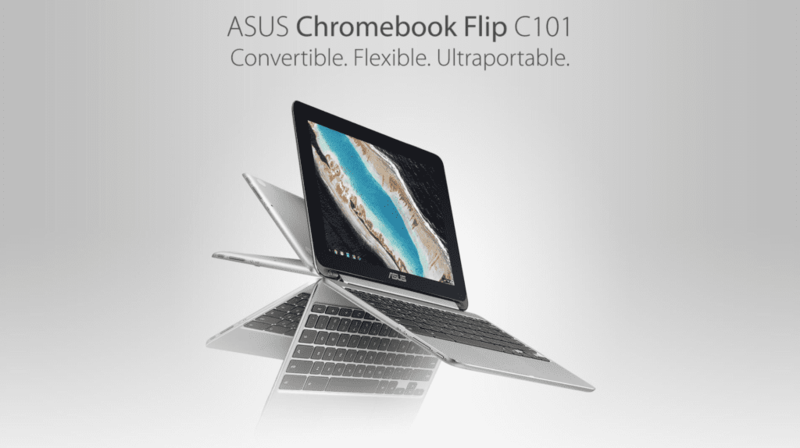 We’ve found ASUS has published a full-fledged landing page for the ASUS Flip C101, and it looks really awesome! There’s not much new here, but the page is fantastic and presents the device wonderfully. There is one new element that we’ve not seen discussed yet. Sure the display is better, the processor is faster, and there is not a 2GB version any longer. Those things are known. If it lives up to that description, this little device could make for quite the entertainment powerhouse. I’ve said it before: with the same chipset as the Samsung Chromebook Plus and only about a quarter of the pixels to push around, this device will move along really well. With a good screen and solid sound, media consumption may be fantastic. That is the sweet spot for ASUS, here. A 10-inch device isn’t really made for long-term productivity. It is made for media. And it looks like ASUS may have the right pieces in place for just that task. Here’s hoping we don’t have much longer to wait.